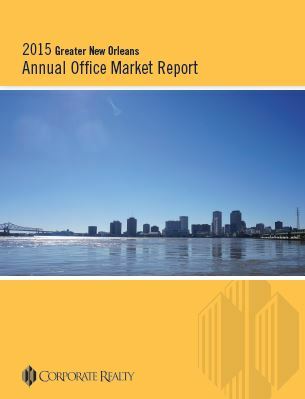 Corporate Realty is proud to present our Greater New Orleans Office Market Report for 2015. We publish this report to give our clients a broad understanding of the Greater New Orleans office market as well as specific information about occupancy and rental rates of each office building. With data from the last three years, readers of this report will be able to understand what is happening in the market now, and how it got to this point. In addition to the lists of basic occupancy and gross (including all operating expenses) rate information for every non-medical office building greater than 20,000 square feet in the Greater New Orleans region, Corporate Realty’s office specialists have summarized the information they have gathered into narratives for each submarket to help share the general story of the local office market. You can download our report here: https://corp-realty.com/reports/. The information in this report would not be possible without the cooperation of our staff and colleagues, and we would like to thank all of those who contributed.